Manual pole operation Conservatory Roof Pleated blinds. Manual cord operation Conservatory Roof Roller blinds. Manual pole operation Conservatory Roof Pinoleum blinds. The use of the products is limited to normal domestic use only. All products must be used in the manner for which they were intended and the guarantee does not cover products that have been misused or abused in any way. The guarantee applies to the UK only. Improper care, inappropriate cleaning, alteration, relocation, misuse or accidental damage to the product. Any repair work by unauthorized third parties on Marla Custom Blinds products voids any warranties. Force majeure, such as floods, fire and earthquakes. Definition of Lifetime Guarantee – Lifetime guarantee refers to the life expectancy of the product and means that the product is guaranteed for the length of time the product can reasonably be expected to last under normal usage. 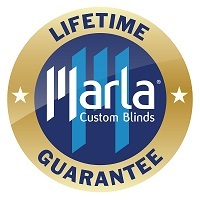 We consider this length of time to be a maximum of 15 years based on the blinds having been maintained annually with the Marla Custom Blinds valet service. Proof of purchase (original Invoice) showing the date of purchase must be retained by the customer as the guarantee is only available to the original purchasing customer. At the discretion of Marla Custom Blinds, the benefit of the guarantee can only be transferred to a third party provided Marla Custom Blinds are notified of the transfer within a maximum of 60 days from the date of the transfer having taken place and then only once the third party has received written agreement from Marla Custom Blinds. In addition to the proof of purchase, proof of the valet service (valet inspection record or Invoice) being carried out at no more than 12 monthly intervals from the date of installation must be provided in the event of a claim. If the product is defective in materials, manufacture or installation the original customer must contact Marla Custom Blinds within 30 days of the fault occurring. We reserve the right to inspect the fault before removal or repair. We must be provided with those facilities we reasonably require to carry out a proper inspection. If a replacement product or repair is necessary, we reserve the right to replace the product or carry out the repair using our own service engineers. If the fault is not resolved, at our discretion we will either refund the purchase price, or install new goods to you as a replacement. This shall constitute our sole obligation under this guarantee.